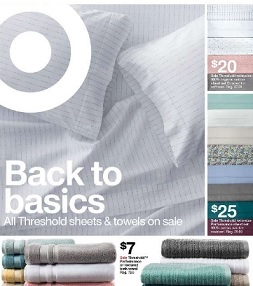 Browse the Target weekly circular sale, valid 1/28 – 2/03/2018: $20 Threshold twin-size 100% organic cotton sheet set; $7 Threshold Performance or textured bath towel; $25 Threshold twin-size Performance sheet set; $35 – $70 Warmer Down Alternative Comforter – Threshold; $15.99 Threshold 6- or 10-shelf birch hanging closet organizer; $149.99 Hoover React QuickLift Upright Vacuum – UH73301; $149.99 Bissell MultiReach Stick Vacuum – 2151; $29.99 Crock-Pot Programmable 6 Qt. Slow Cooker – Black SCCPVL605-B-A; $89.99 Ninja Professional Blender 1000 – BL610; $119.99 Ninja Professional Blender & Nutri Ninja Cups BL621; 20% off Select Gaiam yoga gear; 20% off Select Everlast kickboxing gear; $25 Men’s Cold Weather Quarter Zip – C9 Champion; $15 All C9 Champion Power Shape sports bras; $49.99 HP Envy 4520 all-in-one wireless printer, scanner and copier; $149.99 Vizio D-Series 32″ Class 31.50″ Diag. 720p 60Hz Full-Array LED TV – D32hn-E0; $19.99 My Little Pony: The Movie Singing Songbird Serenade; $7.99 Swiffer; and more.